I got this book from www.betterworld.com because I have recently finished reading The Three Miss Margarets and really enjoyed it. Hopefully this sequel will live up to expectations. What a fabulous read!! I was not sure what to expect in this 'almost' sequel to The Three Miss Margarets, and I was not disappointed. I found the new insight to previously minor characters quite interesting and refreshing. I was gob smacked at the turn of events through the ending and I have much admiration for the authors choice of final moments in the book (The little blurb at the end of the book helped me to understand why she ended it that way). I am looking forward to reading more from Louise Shaffer real soon. 1. Journal the book when you receive it. 2. PM the next person and make a note that you've done so. 3. Read and review the book, preferably within 6 - 8 weeks of receiving it. 4. Mail the book to the next person. PLEASE put on a JE or release note when you've done this. **the reason the book is going overseas then coming back to Australia is because the last two recipients have not finished reading The Three Miss Margarets as this bookray begins. Received today thank you! I have a bit of a log-jam of books that *have* to be read at the moment but I am confident I will get this one read and sent on within a couple of weeks - just not the few days that I usually manage! I enjoyed this although I feel I read The Three Miss Margarets a little too long ago and with too many other books in between, as I'd forgotten the main details of the plot. But that didn't matter too much, as this was a very separate book, and could be read as a stand-alone. Laurel, former wild-child and still sometimes hankering for her old ways, has come into a powerfully challenging legacy. Worse still, her childhood friend's younger brother, The Wiener, is still pestering her. But the legacy gives her power to do good, and the Wiener might just have grown up a bit too... In the meantime, an elderly lady sits in her bed clutching Laurel's local newspaper and mulling over the past. What is their connection and what will happen if they get in touch? A well done and intriguing book. I liked the twist which I think is the one blundery refers to, and the author interview at the end is helpful in explaining that, although it worked for me anyway. I have Cross-Patch's address and will pop this in the post to her today. Thanks for alerting me to this one's existence Blundery! I notice there's a third linked novel referred to in the final pages of the volume - wonder what it's called and when it came/comes out! Posting to Cross-Patch today. Enjoy! Thank you, Liz, it has arrived safely in our snow laden valley! I am looking forward to reading more of Louise Shaffer's work. I'll add my superlatives to the others. I thoroughly enjoyed the plot and style of this book and am a real fan of Louise Shaffer. Roll on the next. Apologies for time taken - travel and jet-lag slowed me down a bit. I am posting the ladies on to purplerosebud this morning. Thanks, this book arrived a couple of days ago but I have been naughty and not journaled yet! Will be able to start it quite soon and from the earlier reviews I am looking forward to it. A very enjoyable book! I liked the style and the way it was written. I liked the characters and could just picture them all, good or bad. The chapters were quite short so I could read and put it down quite frequently. It always intrigues me when authors write about different time periods and different people and move backwards and forwards as I am dying to get back to the time or person I've just left and then once I get into the new person/time I don't want to leave them either. :-) I see there is a link to the 3rd book towards the end although it seems, like this book, it could be a stand alone. Hope to get to read that one sometime. Many thanks for sharing, I am definatley a Louise Shaffer fan. I will be passing it over to calalilly later this week. Thank you passing this on Purplerosebud. I have a couple of rings in front of this. Really looking forward to starting this though after enjoying The Three Miss Margarets. Received this book today from Calalily, thank you. I'm looking forward to reading this & should be able to make a start in the next week. This was a great read, I really enjoyed it. I've been in contact with ladyindigo & have her postal details so I'll be sending this off tomorrow. Thanks Blundery for the chance to read this great book. A change of plans, this will be delivered to L1nda today & then it will travel to ladyindigo when L1nda has finished it. Received today thanks and looking forward to reading! Wow, what a great read, I finished it in 2 sittings as I couldn't put it down. 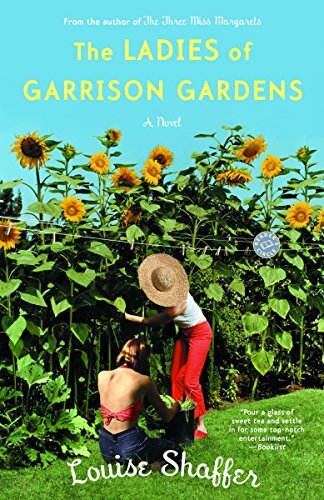 I love the character of Laurel and hope the next book shows how she tackles being the "Lady" of Garrison Gardens. I'll pass it on to LadyIndigo next week as I have another book to finish and send on to her. On the way to LadyIndigo!